Gabrielle Lipton A performance at the Moldy Fig. 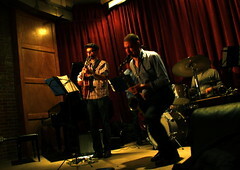 After opening in May, the Moldy Fig quickly made a mark on the East Village-Lower East Side jazz scene. By booking both highly regarded veterans like Bertha Hope and swashbuckling newcomers like Zachary Lipton, it revived a local tradition of mainstream jazz clubs with an openness to experimentation. But on Nov. 23, a posting on the club’s Facebook page announced that Charles Brown, the owner, was ill and in the hospital, and the club would be closed while he recuperated. It’s uncertain when the Fig will reopen, but its closure puts venues like Mona’s, The Stone, and Nublu at the center of the jazz scene in the East Village – a neighborhood that has often been overlooked in the conventional histories of New York City jazz, but has played a vital role. The East Village can’t boast the abundance of clubs that made jazz destinations out of Harlem in the 1920s and ’30s, 52nd Street in the 1940s and ’50s, or the West Village since the 1970s, but it has been home to many of the genre’s most important venues. The Five Spot on Cooper Square hosted two of jazz’s most notable nightclub engagements. A 1957 set by the Thelonious Monk Quartet, featuring John Coltrane, established the prowess of both legends. Two years later, a performance by the Ornette Coleman Quartet introduced the most influential jazz musician of the last half century to a New York audience. Both gigs were booked to last a few weeks and were extended for several months. In the ’60s and early ’70s, Slugs Saloon on East Third Street was a key venue for both mainstream and experimental jazz. The Tin Palace on Bowery emerged in the ’70s, a heyday for informal jazz lofts in NoHo, and it provided a stage for the heralded newcomers from Chicago and St. Louis who were the second wave of jazz’s avant garde. The first location of the Knitting Factory, on Houston between Mott and Elizabeth, was an epicenter for left-of-center jazz in the ’80s and ’90s. In the aughts, Tonic on Norfolk Street served a similar constituency and offered rare performances by jazz giants from Europe. Now, it’s an insider’s scene. The same informal vibe exists, but the venues have changed. There are only a few places left that offer jazz on a nightly basis: Louis 649, an intimate boite on East Ninth Street that opened in 2004 and billed itself as a jazz venue for three and a half years, now plays canned music. But at the same time, there are numerous one-offs. You just have to know about them. One of the best is at Mona’s, one of the first of the current wave of bars on Avenue B. The venue’s Tuesday night jazz party is built around the Mona’s Hot Four, an aptly named band led by clarinetist Dennis Lichtman. 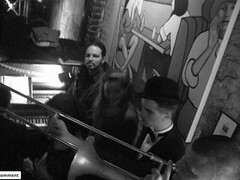 Every Tuesday night starting at 11 p.m. and going till last call, the Mona’s Hot Four plays dixieland, swing and other infectious forms of early jazz from the ’20s and ’30s. 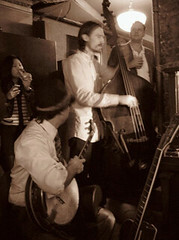 The usual members include pianist Gordon Webster, banjo player and guitarist Nick Russo, and bassist Jared Engel, but the band swells early and often. 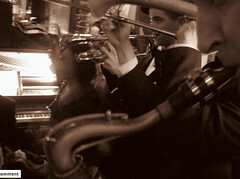 During a typical night, smiling musicians with instrument cases held overhead pile through the crowded dance floor, parting those doing shuffles, waltzes and the occasional jitterbug. Flanking the dancers, a diverse crowd perches on bar stools, yelling in gleeful recognition of songs and clapping loudly in appreciation of terse, witty solos. Over e-mail, Mr. Lichtman explained that the gig started four years ago, after he sat in with the Cangelosi Cards at Banjo Jim’s (now closed) and brought some of the old-time jazz band’s members over to Mona’s. After they started playing tunes, the bartender offered him a weekly engagement on the spot. Mr. Lichtman attributed the night’s success to several factors. “The fact that many great players, young and old, come by to sit in and jam with us keeps the music fresh. Also, because the gig is so late, other musicians can come in just to hang out after they finish up with their gigs. It’s kind of a throwback to the early days of jazz in the 1920s, ’30s, and ’40s, when guys would play their steady big band gig to make money, then go jam in little bars all night into the morning. Down the block, a bit then around the corner, at 178 Stanton Street, between Clinton and Attorney Streets, the Moldy Fig had provided an ambitious counterpoint to the sweaty romp of Mona’s. The club opened this summer to great acclaim. If this were the ’90s, when major labels bought out jazz clubs for weeks at a time to showcase their artists, the Fig would have been a centerpiece of the circuit. Instead, the major labels are mostly out of the jazz business, and venues are left to cultivate their own scenes,which is what the Fig was hard at work doing. Mr. Brown, the owner, was a former manager of Fat Cat, a jazz club in the West Village. The Fig is sleek and deceptively large. The room is well appointed with comfy sofas along the wall and tables near the front. About midway is a large bar with an ample selection of micro-brewed beer on draught and a wine list full of affordable choices. The space is punctuated with board games and on occasions, chess games seemed to break out amid the live music. 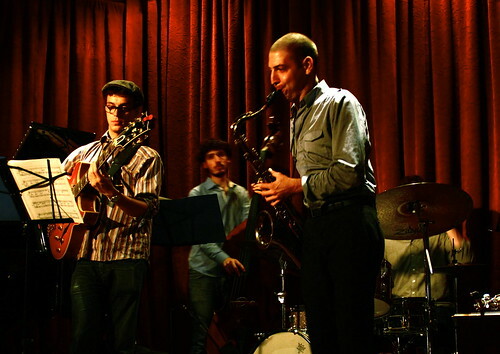 One of the club’s first finds was saxophonist Zack Lipton, who lives and plays a lot in the neighborhood (he does a weekly Thursday night gig at Luca Lounge). At the Fig, he was leading his own band in a set of innovative originals every Friday and Saturday at midnight; then around 1 a.m., he hosted a jam session of leading and up-and-coming musicians doing standards. The straight-ahead vibe at the Fig nicely balances the East Village’s other major venue, The Stone, a spartan performance space on Avenue C owned by composer and reedman John Zorn. At 8 p.m. and 10 p.m., six nights a week, jazz enthusiasts pony up a small fee, usually $10 though occasionally $20 for special events, to hear leading musicians of the jazz avant garde play sets that are often completely improvised. There are no refreshments offered, just a folding chair and compelling music. Meanwhile, when in town, composer Butch Morris has led weekly “Conductions” (fully improvised big band engagements) at Nublu. He will also do workshops at The Stone on Mondays in January. Update: Mr. Morris now leads the Lucky Cheng’s Orchestra every Tuesday at Lucky Cheng’s. Some of the best jazz in the neighborhood remains under the radar, in sets that happen almost spontaneously. One Monday night in December, pianist Richard Clements, a longtime resident in the neighborhood was leading a set of young musicians through a set of jazz at 11th Street Bar during a weekly engagement he runs. Barry Harris, a legendary pianist and teacher, sat to the side. The bar is around the corner from Charlie Parker Place, and Harris actually played with the jazz legend 60 years ago. A legendary figure in his own right, Mr. Harris has taught many of the current key players in jazz. About midway through the set, he rose to his feet, ambled over to the piano bench, and sat in for Mr. Clements. He called out a bebop standard and began leading the young band through some Charlie Parker tunes. In between solos, the musicians eagerly texted their friends or tweeted what was going on. Conversation in the bar quieted to a hush. By the end of the set about half an hour later, the crowd had tripled and everyone, jazz fans, musicians and novices, were hanging on Mr. Harris’s every note.